An astronaut or cosmonaut is a person who goes into outer space. Eastern Bloc countries friendly to the Soviet Union always said cosmonaut. Western countries including the United States said astronaut. 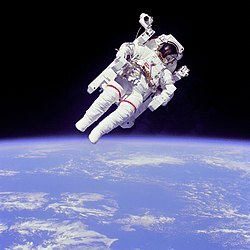 Astronauts are also called "taikonauts" in China or "spationaute" in France. Astronauts used to go into space on the Space Shuttle and the Soyuz spacecraft, but now they only go on the Soyuz. Several countries have worked together to build an International Space Station where people stay and work in space for long periods of time. This page was last changed on 15 September 2013, at 21:22.